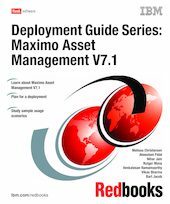 This IBM Redbooks publication is for IBM Business Partners, field personnel, and clients who want to plan a deployment of IBM Maximo Asset Management V7.1. We provide information to assist in the deployment and initial configuration of the environment, but we do not cover general product usage. This book assumes the reader has access to product documentation and some knowledge of previous versions of Maximo Asset Management or other Maximo products that utilize the same underlying framework. Our intention is not to replace or reproduce the product documentation, but rather to provide useful, supplementary information to assist the reader in understanding deployment planning and processes for Maximo Asset Management. Some content in this book provides information helpful to those who are just becoming familiar with the Maximo product set. In other sections, we assume the reader has deeper technical knowledge and experience. In most solution deployments, a team of individuals with different skill levels is required to successfully plan and deploy Maximo Asset Management. For various members of the deployment team, different sections of this book are valuable resources for performing their tasks.